The leftovers of sparkling wine tasting at Mumm Napa. Growing up in Wine Country, I’ve visited my fair share of vineyards. But they’ve all been primarily in Sonoma County, and to be honest, I’ve only visited a handful of wineries in Napa Valley. As part of my efforts to rectify that, my friend Dominic and I made a quick trip to Napa Valley a few months ago to dine and wine for a weekend. The wine part mostly took place at Mumm Napa in Rutherford, where we spent an afternoon in one of the most inviting tasting rooms I’ve ever visited. Now maybe that had to do something with the 10 or so glasses of cuvee I tried, but the service was warm and the view was incredible. Mumm Napa wines are made in the Carneros region of Napa using the same process that is used in Champagne, France, the méthode traditionelle. The result is a wine with high acidity. 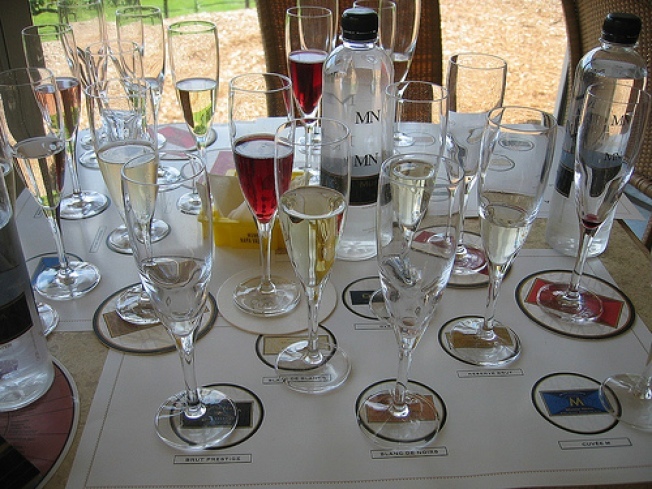 Our guide encouraged us to identify the flavors in the sparkling wines we tasted, and we did pretty well. We tried the DVX (my favorite), the Brut Prestige, the Rose, and the Blanc de Blanc, and uh, I sort of lost track after that. Even if you opt out of a wine tasting at Mumm Napa, the view is spectacular and well worth the drive. The winery also boasts a fine art photography gallery, though it can be easy to miss if you don’t get past the wine tasting terrace. If you can stand the Napa Valley heat in the summertime, now is a wonderful time to go.